The Puerto Princesa Underground River is located within the Puerto Princesa Subterranean River National Park in the Philippines. It is approximately 30 miles north of the city of Puerto Princesa. The underground river is 8.2 kilometers long (5.095 miles). The river is also called the St. Paul Underground River. It is also said to be the longest navigable underground river in the world. This Puerto Princesa river is listed as both a UNESCO World Heritage Site and one of the New 7 Wonders of Nature. 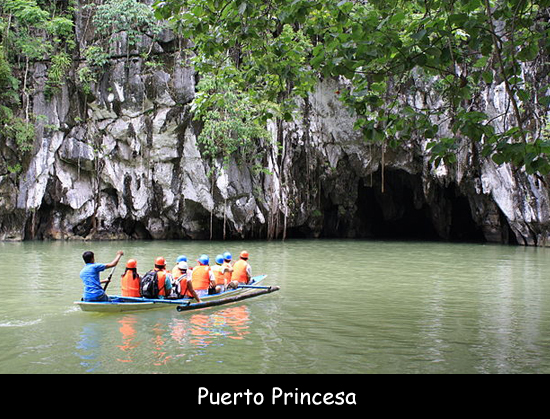 Tourists can travel the Puerto Princesa Underground River in fibreglass boats. Only 4.3 kilometers of the entire length of the river can be easily traveled by boats. To travel the remaining 3.9 kilometers, you have to obtain a special permit. There is a dome inside the cave which reaches 300 meters above the river. Some of the rock formations look similar to objects and images such as a horse, cacao fruit, a mushroom and the holy family. The entire area where the underground river is located is actually a national park. This Subterranean River National Park has more than 800 plant species, including almost 300 trees, 195 bird species, 30 mammals, 19 reptiles, and eight bat species. The flora of this park includes at least 295 trees dominated by the dipterocarp species. Despite being called an underground river, it is actually above sea level. Its water flows into St. Paul Bay. November 11th has been declared by Pres. Benigno Aquino III as “Puerto Princesa Underground River Day”.